Steve Saleen Provides Information On The New Engine In The 2009 Camaro! TRAVERSE CITY, Mich. – Dear sports car fans: General Motors heard you loud and clear. 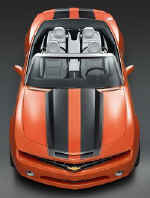 GM Chairman and CEO Rick Wagoner announced today that GM will build an all-new version of the Chevrolet Camaro sport coupe based on the award-winning concept that stole the spotlight at the North American International Auto Show and has ignited the passion of car enthusiasts around the world ever since – even spurring consumers to start petition drives and send in certified checks in hopes of placing early deposits.